Why did I snort you ask? Because I can’t seem to be able to buy any Sun servers. I’ve been trying since July of 2005. So let me tackle this in two parts. Part one, we’ll roll back to July of 2005 when I, a person coming from a “you buy Dell desktops and laptops when you think you are saving money from buying Macs but all the servers are Suns, Compaqs, and SGIs” world, attempted to buy about 50ish servers and terabytes of storage from Sun or HP. Part two, we’ll talk about my recent adventures that started immediately after reading “The Death of the Cold Call”. It was a multi-pronged approach, several of us contacted in-house sales reps for Sun, HP, and Dell who we knew and had (in other capacities) bought lots and lots of stuff from (lots as in millions, tens of millions). All of them took it up and forwarded us into the system. The pipeline. The whatever. The word was that we’d be contacted soon. Then I was going to go to all of the web sites and fill out the have-a-local-sales-rep-contact-me forms. I got around to that at about 1 a.m. and filled out the forms at sun.com, hp.com, and dell.com. I put in succinct sentences about who we were, what we needed, when we needed it and said that I’d be available via phone starting at 7 a.m. PST. Phone rings at 7 a.m. Kid named Michael from the Small Business Unit (where I filled out the form; we actually had no “employees” then, so we fit in their “fewer than 1,000 employees” section). I’m told that we’re in the system, that there were two other entries about us (from the in-house reps we knew, which was nice), that those were going to be merged with my inquiry, and then after discussing the company and what we did, he said we’d be handled by the Emerging Business Unit and, locally, a preferred corporate sales account executive would contact us (because we weren’t the printers-and-desktops buying type but servers-servers-servers). I say “Great!”, and go back to making my coffee. I pour a cup and the phone rings, it’s Steve the local Dell account executive, and thus began the process where we all came under the impression that Steve actually worked for us. In less than 2 weeks we had some chances to “pitch” the company to get into a certain pricing tier, had all the servers in the datacenter, and had managed to get it all leased based purely on the company’s financials (no personal guarantees). And honestly, 95% of all of the work was done by Steve. I felt like a Big Company. I felt like Steve worked for me. Throughout that entire 2 weeks, I called Sun and HP every day with the idea that I’d use the non-confidential Dell materials to wedge a similar deal. With Sun I never got past their 800-number staff (“Hmmm … no one has contacted you yet?”), and HP kept pushing me to local VARs and integrators, none of whom either returned my phone calls or called me after (I assume) getting the referral from HP. See there’s a difference between the sales models of these companies: Dell predominantly does direct sales, and Sun and HP tend to go through resellers (unless you’re big, then you get a rep that sits in your office staring at you, waiting for your printers to run out of toner). More than once though, the Sun people did suggest I just buy the servers off the web site. “OK,” I said, “and what credit card should I put that $220,000 order on?”. “You can put in multiple orders over a few days”, he suggested. “OK … thanks! I’ll try that,” I said while hanging up the phone. That’s just half of the room. OK. OK. So we’re running more and more Solaris on those Dell boxes (actually we’ll be entirely Solaris soon). Then a major client of ours wants entire racks specced out with HP servers and storage: I go with the HP ProLiant BL35p blades. They’re nice because among many things they default to DC power and you get a 1 unit or 3 unit AC-DC converter for them to use AC. That is quite nice. The client that wants HP also spends millions with HP a month: they have an in-house sales rep (he’s the one milling around by the printers). Thus I begin the process of forcing my business onto Sun and HP. I fill out the web forms again. I call HP first. I get a very nice Minnesotan lady on the phone. NICE LADY: How many employees does your company have? ME: We have 24, but I know where this goes, please realize that we’re quite efficient and buy a number of servers every year that’s comparable to companies a 100 times our size. ME: No, no, sorry to cut you off and I don’t mean to be rude, but we’re not going through local resellers. We could just be integrators ourselves if that’s what we wanted to do. I’d like someone in direct sales and I’d like to talk to them today. NICE LADY: Now you said you were going to get ‘blades’? ME: (how this mattered?) Yes the BL35p blades in particular. NICE LADY: OK, I’m going to put you in contact with a blade specialist and he can help you. ME: Hi Adam, this is Jason Hoffman from a company called Joyent, I need to discuss and get a series of quotes for 2, maybe 3, enclosures of BL35p blades and the new 1510i storage system with 2 trays of SCSI and 4 trays of SATA drives. If you could call me back today I’d appreciate it. Not too bad. I’m at least in contact (well, voicemail) with a real person. Adam actually calls back within about an hour, we have a great discussion about the server side of it and he arranges a conference call with the storage specialist the following day. Also goes well. I’m impressed with their effort up to this point, it’s Dell-ish. I know what the client pays for HP, I know what I used to pay for HP, and being generous (meaning I understand that we’re not huge) I know that the quote is at least 30 percent over what it could be (I can even get better prices on their own web site in some cases). Stating this doesn’t get me anywhere, I actually get the impression (and I think it’s correct) that he simply doesn’t have the power to do it or that the internal effort it would take just isn’t worth it. At least give me some love: charge me list on a server but cost on the hard drives. Give me an extra 4GB of RAM for $0 extra. Something. I take that quote and go to CDW. I push. I get a couple of percent lower. HP is basically dead at this point, except what’s bought via that client with the in-house rep.
Now Sun. Who by the way I started calling 6 weeks ago: Monday February 6, two days after “The Death of the Cold Call”. ME: Hi, my name is Jason Hoffman and I’m with a company that’s based out of San Diego and San Francisco, I’d like to talk to someone in sales about the Sun Galaxy line of servers. NICE SUN GUY: I can take your name, number and information and have someone call you. ME: That’d be great. Will it be someone in Southern California? NICE SUN GUY: I don’t know. I didn’t hear from anyone for two more days. So I called back again and stated two things: that I had called before and that I had to buy 4 racks of servers ($1 million; which is quite overstated by the way but I had to see …) “ASAP” and “in Q1”. 2 days later. Not a word. So thus began the “experiment” where I called them every day for two weeks asking to be in touch with someone in sales in Southern California. Someone who could put together a quote for an order of this size, tell me where to wire money or send a check, make sure it’s shipping et cetera. I walked down the road where there’s a four-story Sun building filled with people and asked if there was anyone in “sales” that worked out of that building. Nope. Then one day the phone rings, I answer, and it’s Sue from SUN! Whoo-hooo!! But she’s not calling because of my attempts to reach someone so that I can buy a “million dollars” worth of servers, she’s calling because many months earlier I had attempted to buy a CoolThreads server to test, they said they’d actually send it for free for 60 days (it was the first version of that special) but then after trying to even just buy one for a week, I gave up. Seriously I would have just bought one. Sue was here to fix all that, and supposedly we’re getting a CoolThreads server. It’s been a month but whatever. We’ll see. But I used this opportunity to really dig into Sue about Sun’s sales. Interesting stuff. Then, finally, about two weeks ago, I made parallel proposals to the Sun sales rep and CDW (a good-sized Sun reseller that we buy our console servers, power strips, and lots of miscellaneous stuff from). I say exactly how much we spend at Dell on a model exactly comparable to a Sun Fire X4100. I say how I was actually surprised how relatively low the list price of the X4100 is for what it comes with. I also make the case that the 20 percent discount special that they’re offering for switching from HP, IBM or Dell would put us in the right territory, and reminded them that the stated educational discount is 37 percent. What’s different from an “emerging company” and people emerging from academics out into the Real Server Buying World? Other than that we’ll actually buy more of them? Either of those would put us in a place where we might pay less than with Dell or we’d be at a place where I wouldn’t mind paying for an intangible like the irrational comfort of running Solaris on Sun hardware. I also said that if the price was right, I’d buy about 15 of them now and I’d begin the process of swapping out full racks of Dells for Sun Fire X4100s. 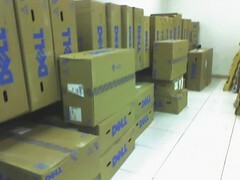 I bought a lot more Dell servers and storage on Friday, and they’re already here. Of course I told them I was shopping around, and they respectfully played ball. The Sun rep responded by putting me in contact with a local VAR. Who did call and leave a very rambling voicemail along with sending me an email. I still haven’t gotten a quote and I just get voicemail when I call every day. I gave up after a week. Then being able to get pricing on X4100s from CDW that’s competitive with Dell apparently requires the involvement of several management layers at both Sun and CDW. That’s still “in progress”. I’m not hopeful. Sun and HP are in tight spots, it’s actually expensive to have in-house people on the ground everywhere, and the amount of dedication and drive those people must have can be difficult for a company to infuse and keep going. Especially when cost-cutting strategies involve pushing more and more sales through VARs/partners/integrators. There seems to be no one with the power to make smaller deals: meaning that we don’t buy servers one at a time and we don’t spend $40 million a year on servers, but we could spend half a million on servers and storage easily. I guess I just wish they’d take me seriously. Thank you for reading all the way to end, and now I’m off to have lunch in Orange County with our Dell account executive and tour a facility there. Interesting. Have you tried dealing with Apple’s sales rep about servers? I did some calculations for couple of storage solutions, and Apple’s XServe RAID seems to be a bit cheaper than others like HP’s. The only problem is, I’m not entirely sure about Apple’s quality when it comes to server storage. After hearing similar stories like this one regarding HP, I’m not entirely sure about HP storage solutions either. Tom: xraids are good pieces of hardware and very cost conscious. Xsan is also a decent piece of software. They do however only do fiber, which I’m trying to get away from. Well, I agree that Sun aren’t amazingly helpful. That’s because they use their re-sellers and VARs to do the sales for them, unless you’re buying 25Ks or the like. The thing is, the resellers are helpful. Great. They’ll come out onsite, take you to lunch, work through your requirements and look after you. Well, at least our vendor does. Give your local reseller a chance. I’ve mentioned this in a post at sunhelp.org. Hopefully it will get someone @ Sun to pull their head out of the sand.. I worked for a Dell reseller for a great while. We got equally great service and were very happy with them. We had a sales rep we loved. He moved on to bigger and better things. We got a new sales rep. He sucked monkeyballs, we called Dell, said “We want someone else” They said “Will this one do?”. We tried her out, and fell in love. (Does that sounds dirty? It wasn’t….we just put in large orders to her.) I like dell…..for servers. Desktops and laptops is a whole other matter. When it comes to Apple, I love their hardware….servers, desktops, laptops. Love. But their reps, whenever I would put in a big order, wouldn’t budge at all. The price never drops, even for repeat, extra-large customers. Oh well. This is amazing. I had the exact experience to a T with Dell compared to HP as you have stated hear. I purchased over $100k in equipment from them and a wonderful experience all the way through and got everything that I need Now, I will NEVER buy from anyone else….bravo dell…. Am I the only person who got the runaround from Dell? The ever-increasing pricing on the same systems? The confusions and delays on placed orders? I must be the only Dell hater left on Earth. I’d rather interact with a computer than any of those companies. Being able to ssh into the SP and get full serial and console muxed together is quite handy when you and your hardware are far apart. I still don’t get some part of your story – the Dell servers are as good as Sun/HP and cheaper, so what was the reason for that Sun fixation ??? lynch: yes in HP it’s the iLOM port, dell’s have a drac card (which we don’t use). With any hardware we still use Lantronix or cyclade console servers. But you’re correct, the SP and iLOM ports make only a switch necessary for console access. Enterprise sales is a tough biz… and it’s not one that’s driven to success from the bottom up. It’s a top down success game, and it sounds (at least from your experiences) that two of those three companies you’re referencing just don’t want the smaller order business… which might be short sighted for them, and might not be… you’d have to be inside those companies to know for sure. I think a better title would be “Where the Sun Don’t Shine”. John Engler wrote:Enterprise sales is a tough biz… and it’s not one that’s driven to success from the bottom up. One thing that philosophy forgets is that all the big Enterprise buyers started out as small companies. If you treat your small and medium sized businesses right you’ll be far more likely to hold onto their business when they ge to Enterprise size. We (UK Education market) got moved from direct sales to resellers quite some time ago. It took us a while to find a reseller we were happy with but in the end I think they can do a better job than the Sun guys sometimes and you still have the involvement of Sun when its needed. The reseller ends up being the Steve from Dell you described in your first anecdote. TextHoff: I hated dealing with people in sales at HP and Dell resellers in Cape Town. HP and Dell both refuse to deal with non integrators / resellers of theirs. At a previous job as a systems administrator I was having to get quotes and order hardware for various locations where the company had servers and offices. The problem here in South Africa is that you always get told it takes four weeks before you can get the hardware and then find that HP has not placed the order properly so that it takes an extra two weeks (so it’s now six weeks) before you get your hardware. Dell’s resellers are more than useless. You never get your quotations out of them although their ballpark figures are a couple hundred rand more than the HP’s. I am by no means a large account either. I have 3 sun x86 servers and a couple 25 tape libraries. Maybe I get better treatment because Sun has large installtions at my university. Maybe because its smaller community here so the local sales staff have less on their plate. I don’t know. IBM comes by every now and then with a huge deal like offering to buy all my current Sun stuff and giving educational discounts on new equipment but when push comes to shove they don’t play ball. Dell doesn’t have AMD equipment so buying X86 based servers from them to run Solaris isn’t a great option. They are pretty good for Sales although the university again is a large account for them so I get treated really well. HP ends up being so overpriced we never touch them. I have a really good VAR that is both IBM and HP and he even scoffs at HP’s prices. Never gotten any educational discount fom HP. So in the end I went for the Sun stuff and I am expecting it to arrive today. IBM was way overpriced for the add-ons to the x series 326m. HP was unwilling to budge on price. Sun gave me a huge discount on 2 servers. IBM then dangled a carrot about a discount if I switched over to a blade system. Then when I tried to get a quote for a blade system they didn’t get back to me. So I’m sticking with Sun. They sell refurbished and “New in box” units that blow the doors off Sun in terms of price—and they’re small enough to care about a $100 order for a stick of RAM. Is anyone else thinking that Dell’s direct sales success is an affirmation of the adage “If you want something done right, do it yourself”? Am I the only person who got the runaround from Dell? The ever-increasing pricing on the same systems? The confusions and delays on placed orders? I must be the only Dell hater left on Earth.——Nope. I used to work at a fairly large public university and we’d put in large orders for desktops at least once a year, but usually twice. So we’d trot in dell, apple, gateway, etc to give us a pitch. Each time we had base specs that we wanted and generally had it lined up with something that already existed in their product line. As a university, we needed systems that last a long time as they get passed down successively until they are out the door. What might start as a faculty research workstation may one day end up being a lab computer as it did the obsolescence tread mill. So generally we would spec out higher end workstations that would remain viable desktops as it worked its way down the system. Anyway, the Dell reps flat out refused to sell us the business class workstation that we had aligned with their specs saying that those systems “outclassed the needs of a typical university user” and that they could sell us more home class workstations for the same price. We balked and explained our rationale (which boggled my mind… we were the frickin customer after all) and they still wouldn’t budge. We ended up going with a mix of gateways and apples, even though we would have preferred the Dell systems. They just wouldn’t take our money. anon, i don’t want to put words directly in jason’s mouth (or into his keyboard, or whatever), but i think the point, as i read it, is just being witness to such a trainwreck of a process from a company that should KNOW better. something that SHOULD be as easy as “oh, you’d like to give us money for our product? well, of course we’ll AT LEAST return your phone call.” you kinda just sit there in bewildered amazement that a company as supposedly large as Sun could operate like this on any level. am i right with that interpretation? Rock: Yes, and I don’t mind VARs and resellers, as long as there is “value add”, there’s selling, they can ship, they can provide for our needs and the pricing is fair and competitive. Bewilderment is the correct word: even being handed off to a competent engaging reseller that can competitively price things would have been fine. Being able to go through the quote-PO-invoice-pay-ship process would have been nice. I’ve never tried to buy Sun products so I can’t compare. My experience with Dell was so horrible that I’ve switched our laptops to IBM (Lenovo) and our servers to SuperMicro. I can’t tell you how many times our personal reps messed up an order. One time he send a server with neither a pre-installed OS nor a floppy or CD drive. We always ordered servers with all 3, so I would have thought that should have prompted him to verify the order with me. One time my peripherals rep quoted a price on LCD monitors. I attempted to buy 11 but my “main” rep said he couldn’t sell them to me for that little. I protested that I had a quote from Dell for that price so he relented and said he could only sell me 7 at that price and the rest at full retail. I protested again that i could buy them for 30% off his full retail price on the Dell site and that I would have expected a little better service for being a repeat, albeit small, corporate customer. The hoser wouldn’t budge so I bought 7 from him, and the remaining 4 from their site. Their leasing department has been a complete nightmare. Their billing has been repeatedly screwed up. Most recently, we returned a laptop that had come off lease. It had included a “free”, as in no charge, we didn’t ask for it, Palm Zire PDA. Sales agreed that it was a $0.00 item but leasing demanded that we pay $50 if we didn’t return it. What I hate most is having to monitor their site for deals vs having a relationship with a salesperson. And even clicking down the wrong path on their site can get you substantially different pricing for the exact same item. As a final slap in the face, Dell donates fairly substantially to the Republican party. Yet another reason to never do business with them, in my opinion. Yes Bob I’ve heard similiar stories about laptops and peripherals. One the guys here has had experiences like that with Dell. We just buy servers, in fact usually one kind of server, and storage. There’s also differences in the support between the two: the “enterprise” server support is right in Austin and in-house, while consumer and peripheral/desktop is outsourced. So while server support is always quite good, I’ve heard horror stories about peripherals, desktops and laptops. I used to try to buy servers from Compaq. I would call sales and ask to buy a loaded ES40, which is a $100k computer. It used to be that I could order these machines directly out of Digital’s catalog, but after the acquisition I had to call and negotiate with Compaq. Suffice it to say Compaq was never capable of selling me the machine I wanted. HP probably inherited that sales team. When I need a half-rack of machines these days I order them from Rackable or SuperMicro. The reps at Rackable are great, and the local SuperMicro integrators are efficient. If I really want a Sun I buy them directly from Sun on eBay. If you really want to have some fun with Sun try ordering voltage regulator modules or expansion CPUs for the V20z. Good luck. Jason, it’s disheartening that you have had this type of experience and my comments are by no means intended to justify it. I do think, however, that an explanation (of sorts) is appropriate. Sun’s primary objective in building a channel in the early 1990s was to develop highly competent, indirect sales and support resources rather than continuing to add more direct field resources. The strategy involved making it very difficult (and costly) to become a Sun reseller but off-setting that with a very strong business proposition (by leveraging the business of existing customers). This strategy worked very well and produced resellers that were every bit as competent, if not more so, than Sun’s direct field resources. By the late 1990s, probably a dozen of these “Sun-dedicated” partners made it on the Inc 500 list. For the past 15 years, Sun has focused its direct resources on its largest customers and continuously tried to incent the resellers to focus on the “other 80%”. Unfortunately, many of these partners are fully entrenched in those large accounts and the legacy business proposition still drives the resellers’ behaviors. If you remember (or heard of) the impact to a reseller of a Medallion from IBM when they introduced the PC, this is similar to the lure of becoming a Sun reseller. Unfortunately, it requires an immense amount of hard work and perserverance and many resellers never reach the pinnacle (but still chase the dream). The minimum annual goal for a Sun sales rep is, I believe, around $7M but typically is more like $12-15M, of which 80% of that is expected from existing accounts. It takes a lot of Galaxy boxes to make a dent in that number and they focus on E25Ks and large SANs whenever possible. Alas, the same math applies to Sun’s resellers. Actually, it impacts resellers even more since they are paid on margin while Sun reps are paid on revenue. As we all know, margins are higher on the larger systems, compounding the issue. I’m surprised that you didn’t get a more energetic response from CDW since they are restricted to selling only 4-cpu systems and below. Sun has recruited a few well-known corporate resellers like CDW into a program with much fewer requirements and greater flexibility to focus on the Opteron/Galaxy products. However, with experiences like yours, it obviously isn’t working yet. I do want to correct a misperception on your part. The Galaxy products were introduced with Sun’s new “street pricing” strategy. The margins are quite slim. Those Edu customers you referred to get no more than a 5% discount (maybe 10 in a very large, competitive opportunity). Since the performance results on both the Galaxy and Niagra products would seem to indicate a very good price/performance ratio, senior Sun management will probably continue to hold the line on the current pricing. All that said, I know there are numerous, quality resellers that would have desperately tried to win your business. Clearly, Sun needs to do a much better job getting opportunities like yours to its many capable resellers! Great post, such an interesting experience. Thank you for the input Buzz. I love your article and I really hope someone at SUN read it – I’ve had the exact same experience here in Denmark. One rack cabinet is now filled with DELL which could have been SUN! As a former Sales Executive at Sun, I am disappointed in the poor responsiveness you received. Clearly room for improvement! Buzz is correct, Sun, like HP & IBM, focus their direct resources on the top 100 or so accounts. The remaining territory accounts are services primarily by Sun’s extensive partner community. I have recently established a Sun Var as I fully believe in Sun rising up again. I urge you to call your local VAR as they are eager to enter into a business relationship with account of all sizes. Personally, I would prefer to do bsuiness in smaller accounts as you can form a tighter partnership over time. Give Sun another chance. If you are not satisfied, call or email their senior executives as I know they will be all over it. We had a very similar experience with IBM! We already had quite a bit of IBM gear in our racks, so it seemed a reasonable place to start with our next wave of servers. After waiting over three weeks to get a simple quote, I gave up and called Dell. I was phoned back by their state sales manager within the hours, had a conference call involving that manager, a technical lead and a third an hour later. Sure as the sun rising and them sticking to their word, the following morning we had an array of quotes waiting for us. We’ve negotiated excellent pricing on various server models, have bought a swag of kit through them now and the service is excellent. We order it from their site, it is built, burnt in and shipped to our door in Australia in 5 working days on average. We’re so impressed with their service, that we’re now switching our corporate desktop’s over to Dell as well – our HP contract was coming to an end. I’ve said it before and it rings true for just about every industry – service will get your customers and keep them coming back. Not surprised unfortunately, if it makes you feel any better, I have heard similar sagas from dozens of different companies. It seems that excessive focus is being put into supply chain management, large corporations trying to bring their costs down and manage supplier lead times. There appears to be much less focus on order fullfillment. Dell being the exception, they have honed the process into a science. As you experienced with Sun and HP, both are pushing leads down to local resellers and or to local territory sales reps who are already overwhellemed. The process only loosely matches the ablilities of the local reseller to the requirements of the potential customer. Nor does their appear to be any follow up by the manufacturer as to whether the reseller responed at all much less was able to meet your requirements. Check out our company, part of our value propostion is that we manage the supply chain process, on your behalf. Plus out source integration, tech support and much more. Sorry for the sales pitch, good luck. I’m helping my wife get an educational quote for ‘something that runs windows and holds more than 4 GB of RAM’. Easy, right? I call HP, she has a quote to my wife that day. I’ve finally figured out who to call about what at IBM. At Sun I had to call and write and finally use my working at an Enterprise account to lean on them. I must have gotten someone’s attention because I got a call back from someone just wondering why I hadn’t been called with a quote. Then I got 2 calls and a decent quote. Of course if my company didn’t buy E25K’s it might have been different. What this tale of woe actually shows is that some people clearly don’r research the company they are buying kit from. Sun don’t sell direct, unless you’re buying the really top end kit – the kind of things they only make a handful of because they are so expensive. Sun rely on local resellers, such as ComputaCenter, who in my experience are very helpful. During my last round of buying, we evaluated Sun Opterons versus Dell 1850s. The Dell machines were more expensive, and despite the higher clock rate their Xeon processors were consistently trounced by the AMD chips. Having decided that Sun was they way to go, we then negotiated a price for the racks on the basis that Dell racks are significantly cheaper – we employed a subterfuge where we said the Sun reseller would lose the sale unless they priced their racks closer to the Dell ones. Frankly, if the poor build quality, higher price and lack of enterprise class features (such as monitoring hardware/software) are not a problem for you, then by all means go with Dell. They may be easier to deal with on the sales front, but we have eight year old Sun boxes still chugging away long after their Dell or Compaq counterparts have been scrapped. Thanks for sharing your story. I run a boutique industry analyst firm that tracks the server markets/vendors and am constantly surprised how these supposedly sophisticated organizations fumble the basic blocking & tackling skills needed to sell products. On the vendor side, it is becoming increasingly difficult to build technological competitive advantages – sure, they can leapfrog their competitors, but competitors eventually catch up with leaps of their own. This is why it is so important for them (vendors) to differentiate themselves through how they treat their customers and help customers get the most bang from their IT buck. The vendors who do not do this – or enable their partners to do this, are doomed in the long run. As someone who follows the industry and vendors, I am interested in collecting these types of war stories from the real world. It helps me stay grounded and avoid falling under the spell of the vendor reps Jedi mind tricks. So shoot me an email if you have a particularly horrible (or good) story about your experiences with enterprise server vendors. I will keep all information confidential and am not trying to sell anything. I need to understand how many systems you want and if you have applied over the web for the Try & Buy. Please email me your number / email address. Hi, Jason. I’m happy you are running Solaris on your Dell systems, but I’m sorry you had a bad experience with Sun. We need to do better, no question—no matter what our engagement model is. Service is service. To me, every Solaris customer or developer or admin is a potential OpenSolaris community member—no matter how much he/she buys. We are building a community that reflects everyone, not just Sun’s large customers. I spoke with Sanjay Moona a few minutes ago. He’s a really good guy, and he’s determined to make things right on behalf of Sun. I understand from our conversation that things are moving in the right direction. I left a comment on my blog as well: http://blogs.sun.com/jimgris?entry=many_views#comment3Best of luck and let’s stay in touch. I commented on your post as well, that other Jason isn’t me. Jason,Great blog. Being a Sun employee, I am assamed to see the bad experience you have gone through. On the possitive side is that I got this link from my new CEO’s blog, so he knew about this and being a person he is, I have great expectation things will improve! Holy crap! I actually laughed at the picture of a room full of dell servers. I just completed purchase today on 35 new dell servers, ibrix software, and some 22 TB of storage, and I had the EXACT same experience you did. Man, I wanted Sun gear, more than anything. Or HP. On the systems we were buying, after I pressed the hell out of it, I got HP down from 3700 a unit to 3400 or so. For the EXACT same hardware, Dell offered me (end of quarter) less than 1500 bucks. Crap, disposable servers anyone? And Sun! SUN! I never could get ahold of a quote from anyone. Honestly, I ended up buying from Dell because they didn’t actually have any competitors. This is the third time this has happened, to the tune of over 850k in purchases over the last 2 years. Anyways, whatever. Nice article. I hope the guys from Sun read this (more than the 1 guy above), as here in startup land the only reason they’re not selling servers is because I (and apparently you too) can’t actually order them, which is a very, very stupid reason to be losing marketshare. I’ve read your story and have a question which looks like others above have not asked. Your story mentiones you’re a startup company (corp or commercial) but also mentioned getting or requesting educational discounts/pricing as if a University is purchasing? Companies normally do not view educational discount based on the type of usage a server will have but edu pricing is determinied if the buying organization is a qualifed institution or not. That being the single cocktail napkin version as there’s other variables but for this situation… I’m wondering if by chance that HP & Sun had passed your lead to the wrong business unit or wrong channel partner as commerical/corp/business units can not provide education/University products/pricing for a corporation. Also for channel partners, not all channel partners offer the same products. I’m from the software industry so for the software market, there could be partners focused with Gov only, Gov & Edu and others with Commercial… If a partner does all of the above, then they would have seperate business units that handle the vertical markets as well. If the education pricing request wasn’t in your call, i’m wondering if that would have yielded a different outcome w/ Sun & HP. Hi Jason, Sun also has a program called Customer Ready Systems (CRS) that delivers servers and storage pre-racked to shorten deployment time. CRS can also handle third party parts, asset tagging, putting on a software image. Really anything that will help shorten deployment times and increase the quality of the final configuration. The picture you included with the Dell servers was surprising as these appear to be at least several days away from being productionalized as opposed to the hours that a Sun CRS solution would require. Feel free to contact me if you have any questions. I feel your pain on this one.. I used to work for a 35-40 person company ( a fact which I tried to hide) and got blown off by Compaq (back b4 hp/cpq) and they refused to deal with us until they found out our manpower. We were growing faster than we could handle and would be 200 strong within 2 years where servers would outnumber people at least 2 to 1. The thing is, we were a rapidly expanding and incredibly successful hedge fund (one of the top 10 in the US) with at that time, about $2billion US AUM. We had no budget at all, bought the best available. To this day, a new hire (this is before trader requested hardware) whether its a secretary or trader is almost a 10k layout. Desktops were DL360s which used cat5 extenders from Mighter ($1k per transmitter receiver pair). We were moving to new office space so we wanted the most bleeding edge stuff not to mention it was a 100% parallel construction. Not a single piece of hardware was going to make the trek from downtown to midtown (even vendor equipment). We wanted to reduce the amount of equipment under desks to minimize a high frequency stat arb trader accidentaly spilling something on his machine or kicking a cord outand having the markets move away from him. Basically we made it impossible for a trader to blame his losses on technology. We were heavy on solaris and intel, and would buy whatever a new trading group needed to run their strategy. Our sun number for the new data center was HUGE.. We never had a problem with Sun as we were the focus of several case studies which helped to fortify their place on the trader desktop as x86/linux started to become viable competition. Since we were so Sun heavy our wintel servers were few or mostly vendor owned, and our Proliant 6000s running netware 3.12 at the time (freebsd later) NEVER went down until our generators and UPS gave up a few days after 9/11 (we were in 111 bway too.. so thats an impressive feat) so we were shopping for a new relationship. Compaq blew us off many times ,the rudeness increased with each attempt. I dont think the concept of servers being used as workstations sunk in until it was too late. Being in shock from that, we thought that IBM would take rejection to the next level, but we had to give it a shot as our other choices were slim (dells offerings werent that impressive to us back then) but they pleasantly suprised us. They won our $6 million purchase and threw in a full closet of spare parts and memory that allowed on-site reps to come whenever it was convenient to diagnose/replace the hardware, assisted us in getting a Microsoft software package and benefits normally afforded to much larger companies, access to IBM test facilities to experiment with new/alternative applications and infrastructure, and like a 50 pack of IBM training vouchers for almost any technology. Over the years our relationship soured, especially when the 1U xseries of servers started to experience severely high rates of failure. Compaq/HP had been waiting in the shadows at that point and stepped in to stepped in to save the day although like IBM had a hard time fulfilling our orders in both competetive price and quantity (this phenomenon still boggles my mind). CDW then stepped in (whom I also used in a later job at a software company who shipped hardware with its system) and was also to match vendor perks in a much more useful way. It also helped greatly to be able to order a 48 port Cisco catalyst blade with each rack of servers I ordered not to mention the various software licenses those servers would require. They even allowed me to upload my ghost images for various machines and specify which servers would require what image, hostname, ip address, etc so that I only needed to install and configure my company’s application and nobody elses. They maintained all my hardware and software inventory in a database along with my purchases so that I could run monthly/quarterly reports for our accountants and perform advanced queries on the data so that we could figure out other methods to charge for our services which proved to be invaluable when we started offering hosted ASP versions. It allowed us to charge more for users who consumed more CPU, DB queries, and Market data than simple buy low sell high type customers. I’m no longer in a role that worries about hardware and software purchasing, but I am working on a product of my own now and looking to do a real business plan in hopes of seeking venture capital. I’m sure I wont get the deep discounts my employers did, nor do I hope to ever need to (I’m heavily leveraging virtualization for redundancy and scalability), but my core infrastructure will cost a pretty penny and I will definately give my old rep a call to see what he’ll be able to do for me in both Sparc and Wintel arenas. Hi Jason. I know this blog was written quite a while ago, but I just stumbled accross it today. I would like to let you know Technologent is a Sun Certified Partner, and we have a whole list of value adds, including competitive pricing, service at your becking call, we provide MVS (multi-vendor support), are Woman Owned, the list goes on. Like other bloggers have said, we take clients out to lunch, talk about their environment, and help them in any way we can. You will always be able to get ahold of a Technologent rep. Give me a call if you want to talk about any issues you have, or just to find out more.